Today is the day that video game men get their own trailers. 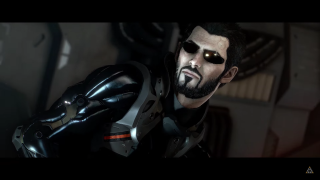 First Assassin's Creed Syndicate's Jacob Frye, and now Deus Ex: Mankind Divided's Adam Jensen. Sorry, I mean Adam Jensen 2.0. "I used to know what tomorrow looked like," he begins, which is a way more impressive skill than the "gun-arm augmentations" and the rest so it's a shame he doesn't have that precognition anymore. You can watch the trailer to find out what he does have, however, which includes lots of different ways to kill people. Look, basically all this trailer will give you is close-up shots of Jensen's gun-arm and some action-movie quips, but if you want to know what it's actually like to play Mankind Divided then Tom has an extensive hands-on that you should definitely check out.